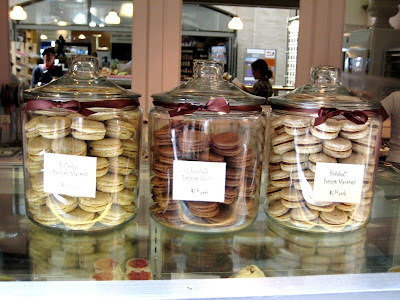 I think they look yummy :) And I applaud you for trying them... the idea of baking macaroons scares me! *hugs* do try them again... bet they get feet next time! Yum, they do look tasty!! I had more success with Tartelette's recipe -- I think that'll be my go-to recipe from here on out! This challenge was quite the struggle! congrats! they are beautiful to me! oh they are pretty and I think they taste delicious. At least you were able to complete the challenge. I've read that many had serious problems with it. I must commend you for trying this month's challenge even though it scared you. Macarons are a bit tricky and it sometimes takes a while before you get it right. mine stuck too, but I followed a tip, I think from Syrup & Tang, and stuck the parchment paper + macs in the freezer for about 10 minutes, and they came off pretty well. Mine turned out surprisingly well for my first piping, first meringue (by hand, ugh) and first ganache. I'm excited to try again. Happy to hear that your were delicious! Good work. I think they look delicious! My egg whites fell so my cookies were flat, but the flavor was still good. I enjoyed this challenge but will try it differently next time. I had a very similar experience- no feet and lots of stickiness; still, I enjoyed them very much. I think yours do look great in their own special way! I think that you did a fabulous job. They don't look bad at all. I know that presentation is 50% and everything - but if you said that these tasted great then I'd say it was a 100% success! Kudos to you! Mine reduced me to tears when I first tried Olga...didn't get anywhere close to yours. It took me 6 tries one single morning to figure out what worked for me...and I know you'll get there faster! Love the 'oozing' chcolate pictures! Truly yum! I think they look lovely =D. Its like they are all feet, instead of just feet poking out (which makes them even more awesome!). They still look pretty and I bet they were delicious too! Well they tasted great and I'm sure that the looks will come. Great effort on this challenge. Cheers from Audax in Australia. Great job with the challenge. I still haven't attempted them. Some day! I feel soooooooooo much better knowing someone else didn't perfect the macaron on the first try!! They still tasted like macaron, right? that is all it counts. I have that same issue with them sticking to the paper. I am going to try it again very soon. Good job on your first try, i dont know how some people just get them so perfect, for me it gets better each time i attempt them, but no cigar yet. 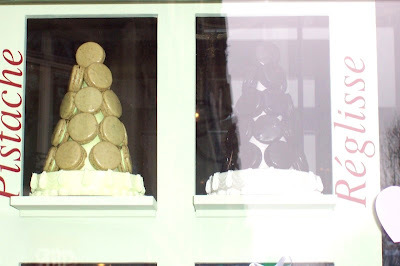 Pity that your macarons didn't work out. However, the photos of what you did end up with look superb! I love the pictures from your trips--*sigh* I need to get to Paris someday. :) I had the same thing happen to my first batch with the recipe--not the best one. But they look delicious! O.... haha... I love how they look Olga! Really not so bad for a first attempt I would say! Mine were completely crumpled the first time if I recall correctly! 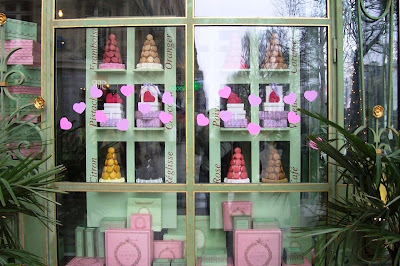 I've been to Paris with my sister too a couple of times.. :) Not so romantic but great fun nontheless but I only visited Laduree with Tom years later... That was my first taste of macaron-heaven.. Now if only I would manage to succeed in making them myself! Feet or no feet, they still love lovely and I et they taste good too! Definitely applaud you for trying... macarons are so hard to make!